Valletta-Malta –26 October 2016 – InfiNet Wireless, the global leader in fixed wireless broadband connectivity has today announced that they have successfully provided a wireless broadband network solution to the Kazakhstan Railway, the first of its kind within the region. 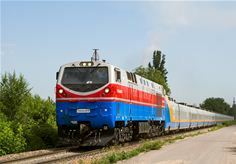 The unique wireless link has been deployed as part of a pilot project connecting trains and railway stations in a single network covering the Astana to Borovoye section of the railway network. It provides passengers with high-speed Internet connectivity for the duration of their journey. During live trials, network speeds reached up to 80 Mb/s per train, while the train’s own speed was up to 200 km per hour, with data transfer remaining constant in large open areas and tunnels. To make the network low cost and robust, small wireless devices were installed externally to the train and could bear the wind load of the train as it reached high speeds. Additionally, the trains will be integrated into a security system comprising of video surveillance and alarm buttons that are connected to a shared monitoring centre. The solution was demonstrated and endorsed by representatives from the Republican State Enterprise ‘Kazakhstan temir zholy’ (KTZ) and JSC Transtelecom. The pilot project was implemented jointly with KRIS-Service, a local InfiNet Wireless integrator and initially deployed on passenger trains and the KTZ technology and maintenance fleet. Wireless technology allows for high-speed Internet access for passengers as well as stable voice communication throughout the train journey. Several issues that are specific to railways can also be solved effectively through the implementation of wireless connectivity, namely establishing an interactive and automatic system that can control and register tickets and to connect every train to a corporate data transfer network. These measures ensure the full control over train schedules and allows for a timely response in the event of an incident.